HOW WILL THE CINCINNATI REDS SPELL RELIEF? It is no longer an enigma; the Cincinnati Reds will need to locate bullpen help if they want to remain in the 2010 playoff hunt. The Reds have lost their last two attempts at the San Francisco Giants, both games being entirely within reach, until the Reds' bullpen entered the game. On Monday, Johnny Cueto clearly struggled (6IP, 10H, 4ER, 5K) against the Giants, but held himself together enough to keep his team in the game. Cueto left the game down 4-3 in the sixth, but the Reds' offense offered two runs in the bottom half of the inning, giving the team a 5-4 lead and a possible victory for Cueto. Danny Herrera came into the game in the seventh with only one run allowed in his last nine appearances. Herrera quickly allowed two singles to Giants' hitters. After recording only one out, Herrera was pulled for the young Enerio Del Rosario. Giants' shortstop Juan Uribe drove in his third and fourth RBI of the game off Rosario with a single. Arthur Rhodes and Logan Ondrusek finished the game with scoreless appearances, but the Reds' offense was out of gas as they lost to the Giants 6-5. On Tuesday, Sam LeCure made his third major league start against the Giants. LeCure pitched well during six innings allowing only one run on five hits. LeCure left the game trailing 1-0. After Logan Ondrusek and Arthur Rhodes recorded four outs without allowing a run (WOW! ), Nick Masset entered the game. The Giants continued their singles parade from the previous day and scored two insurance runs off the seemingly hopeless Masset. In the end, the Giants only needed one as they blanked the Reds 3-0. Matt Cain pitched a complete game shutout (7H, 2BB, 5K). 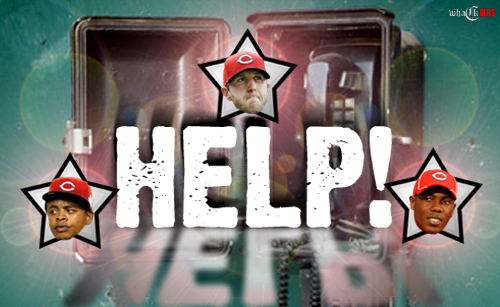 The Reds' bullpen seems so desperate that even David Weathers has offered to help. Walt Jocketty quickly disposed of the rumors, but it still makes one wonder. Enduring the apparent inadequacies of the Reds pen, along with Mike Leake's innings beings closely monitored, Arthur Rhodes playing hurt, and closer Francisco Cordero remaining in his funk; the Reds may need even more help than suspected. Where will we find it? The Reds' farm system is very deep when it comes to starters. Relievers; not so much. Aroldis Chapman has been speculated to possibly become an option out of the Reds' pen, but Walt Jocketty has said otherwise. It is hard to imagine that the Reds would risk his demise experimenting with him in relief situations. Chapman will likely spend more time developing in Louisville than any fan would like. Even when he is ready, he will probably have to wait for a hole in the rotation to open up. Not a bad problem to have. Homer Bailey made his first rehab start in Louisville on Tuesday (4 1/3IP, 5ER, 6H) after coming off the 15-day disabled list. Rookie Sam LeCure has pitched very well (1-2, 3.12) as Bailey's replacement and could slide into a reliever role once Bailey returns to the Reds. If Reds' starters remain healthy and effective, Edinson Volquez could become an option for the Reds when he returns from Tommy John surgery. Volquez is currently rehabbing in extended spring training in Goodyear, Arizona. His 50-day suspension will end on June 12, but he will not be available to pitch until mid-to-late July. The Reds will need help before then. The obvious option would be Louisville, but there is not much there. Carlos Fisher (9.82), Logan Ondrusek (9.90), and Enerio Del Rosario (1.35) have already been up and down this season and have suffered from their inexperience. All three pitchers have showed signs of dominance, but are not ready to take on the savior role for the Reds' harrowing pen. Louisville starters Travis Wood (3-4, 4.15) and Matt Maloney (4-3, 3.55) could be converted to relievers to help their major league affiliate, but the decision would deplete the Bats' rotation considerably, creating a contrary impression. We have already seen potential youngsters (Fisher, Ondrusek, Rosario) tangle with major league hitters and the dubious chance of a Wood or Maloney endeavor suspends the idea of farm system assistance. Jared Burton is rehabbing in Louisville (1-1, 6.30 in 9 games). Burton did not make the team out of Spring Training and has been working his way back from fatigue issues this season. He has spent most of the last three seasons in the majors (10-3, 3.47) and will be back with the club once he regains his endurance. Burton's 4.40 ERA in 53 games during 2009 suggests he will assist, but not save, the Reds' bullpen. It appears that the solution will need to come from another team. There are currently five teams in the majors that are ten games or more out of first place. With trade-bait like Yonder Alonso, Juan Francisco, and Chris Valaika; the Reds could easily acquire what they need. If the Reds' appetite craves the 2010 post-season, a serious addition to the bullpen is mandatory. David Aardsma: RHP with 12 saves for Seattle this season. Seattle is currently 13 games out of first place and desperate for a bat after Junior announced his retirement. Just kidding about Junior, but the M's do lack outfield depth. Chris Perez: RHP with 5 saves and a 2.95 ERA in 23 games for Cleveland this season. The Indians have slid 12.5 games behind the Twins in the AL Central. Will Ohman: LHP with a 3.38 ERA in 29 games so far for the Orioles. Ohman knows the NL Central (spent '00-'07 in Chicago), and was second in the NL in games (83) and fourth in holds (23) during 2008. The guy is a workhorse who knows how to get hitters out. Ohman has great breaking pitches and could capitalize with the Reds' solid defense behind him. The Orioles are already 20 games out of first place and will be unloading soon. Aaron Heilman: RHP with a 2.84 ERA in 26 games with Arizona. The D-Backs are 11.5 games away from first place and have a trade history with the Reds. Heilman and Arthur Rhodes would be a nasty R/L setup-man combination. Kyle Farnsworth: Another ex-Cub who has posted a 2.70 ERA in 20 games for Kansas City this season. Farnsworth's heat and control would be a great ingredient for the Reds during late innings. Kansas City is currently 10.5 games out of first. Farnsworth would probably fair well in a return to the National League since his departure during the 2005 season. He can fight too.